Has it been raining like crazy this weekend where you live too? Saturday night into early Sunday morning we had some pretty big storms with thunder, lightning, downpouring rain and even some hail mixed in...which made for not the best sleeping as we all woke up to our house shaking with the loud thunder claps! It's been pretty dry, so I know we need it but YIKES! It was a rather rude awakening! The good thing about April showers is (well, you know the rhyme! ), they help bring in May flowers and green grass and buds on the trees... ah! Love Spring and all the new colors that emerge after such a long, cold, white & gray winter. Over the past few weekends when I've had a bit of free time, I pulled out a new to me stamp set collection from PaperTrey Ink called Scattered Showers to make some Bridal & Baby shower cards for my stash. I didn't have a set quite like this one in my stash and I've been eyeing it for quite awhile as it's a pretty old set of theirs. 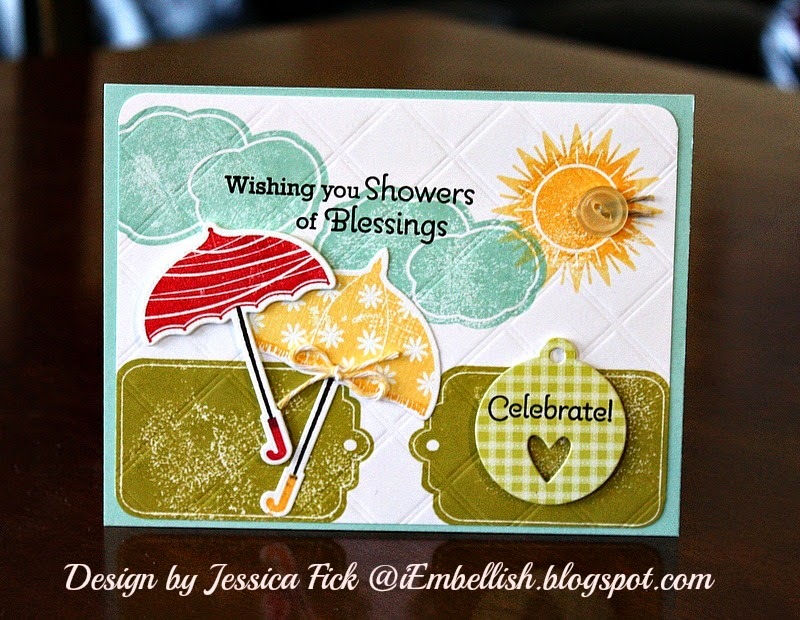 I'll be sharing several cards I made over the next week or so that I made with the two stamp sets and coordinating dies - they were so fun to play with! For my card today, I stamped the scene on some white cardstock and embossed the entire panel with the Guidelines Impression plate - one of my favorites for the subtle texture it adds. Then, you can see that I added the tag and umbrellas on top to finish it off. Just a bit of buttercream baker's twine from The Twinery was the only real embellishment I added besides the button to the sun. 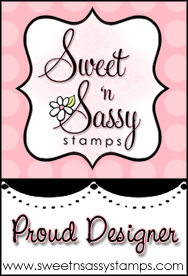 A pretty flat card, easy to mail that can be used for just about any occasion, don't you think? Most of the others I made are specific to babies or weddings but not this one. It's always great to get a chance to play with stamps just for fun, isn't it? I love working on assignments too, don't get me wrong but playing just to play - is pretty great. Have a great day and I wish YOU showers of blessings on the Monday morning! 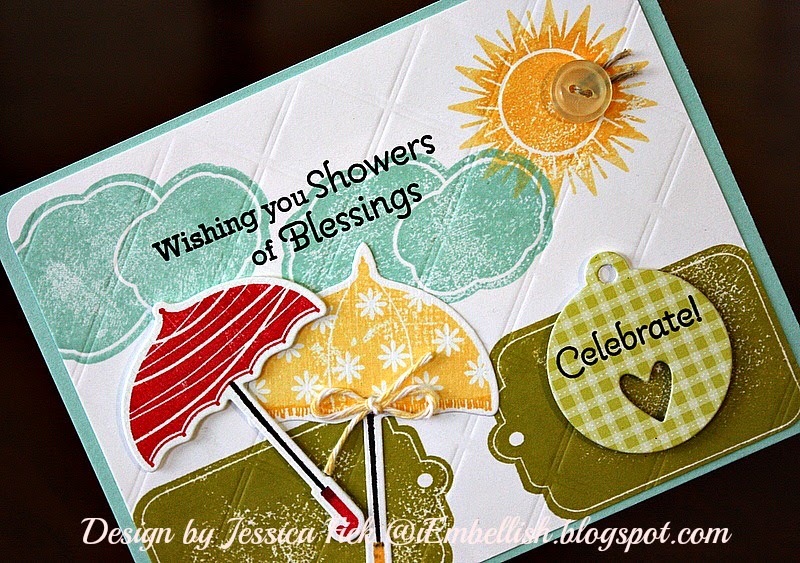 Lovely card Jessica - and the embossing is so appropriate - it reminds me of rain. We too are having rain and thunder storms - but ours are heralding winter.